Who and what are these three figures, proximate yet separate, together yet apart? Each head and pair of arms emerges from a terra-cotta stand-in for the body: an imposing amphora, absent its pointed bottom, perched on its (silent) metal-covered mouth. Like a tiny fleet navigating across the museum’s stone floor, they seem to be caught up in a moment of star-crossed communication, though its content remains a mystery. The image you see on your computer screen does not make this clear, so let me emphasize that these “figures” are not “life-size.” Their reduced scale is a deliberate choice on the part of their maker, Juan Muñoz, a multitalented and deeply articulate Spanish artist known primarily for his installation-based sculpture. The figures’ size heightens the separation between the theatricalized space around and between them and that of their audience: us. (Curator James Lingwood once remarked that space should actually be listed as a material in Muñoz’s works.) 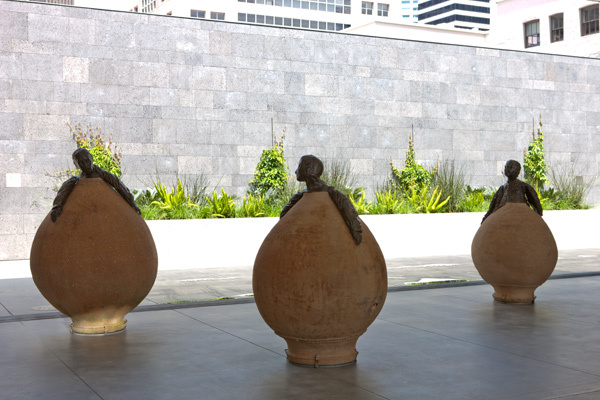 Were you able to approach these three, you’d see that up close they still seem as though they are being seen from a distance, their blurred features suggesting captured motion, despite the fact that they are planted like trees in these enormous pots. You also might notice that their floppy arms are more like those of puppets, or some kind of mannequins, than the limbs of human-like surrogates in which we can see — or feel — ourselves. Yes, all of these things would seem to make a direct empathetic response pretty tough. As I gaze at them, though, something tugs at the part of me that yields to any hint of narrative, instigating a moist swell of pleasure and emotion — almost involuntarily, as with one of Pavlov’s salivating dogs. I note this reaction with amusement, thinking how Muñoz would understand both my yearning for a story, any story, and the impossibility of offering one. Though he did on occasion describe himself as a storyteller, it might be more accurate to say he was a maker of fiction. There is no specific time and place suggested here. Neither is there a beginning or an end. There is, perhaps, another material reality being represented — parallel to this one, but definitely Other. If I let go, as he suggests, I find myself able to speculate what the three figures might be conversing about: the endless aeons that the spirit rolls around the cosmos, once it is free of the heavy body, the hopeless flesh. In the radio program Third Ear (1992), Muñoz proposed that there are two things that are impossible to represent: the present and death, and that the only way to arrive at them was by their absence. Titled Conversation Piece N.Y. (1, 2, and 3), this group of figures is one of a series of works Muñoz made in the first half of the 1990s. The term “conversation piece” refers to a kind of genre painting popular in the 17th and 18th centuries, in which a group of people — family, friends — engages in activities together. Later conversation piece also came to designate an unusual object that stimulates an exchange of opinions or ideas. 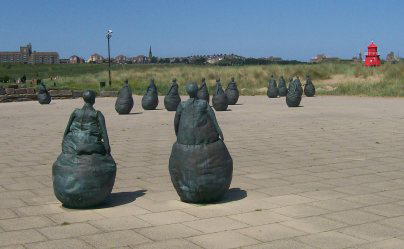 In other Conversation Pieces, the torsos of Muñoz’s figures emerge at various angles from sack-like bases (likened by one writer to punching bags, though sandbags would be just as appropriate a simile), gesturing to one another or whispering together. These mysterious groupings became signature pieces for Muñoz, and are still the best known of his works. He resisted such pigeonholing, however, and made the last one — called, appropriately, The Last Conversation Piece — in 1994. It can be seen at the Hirshhorn Museum and Sculpture Garden in Washington, D.C. In the fall of 2001 a long-planned traveling retrospective of Muñoz’s work opened at the Hirshhorn; I saw the show a year later, when it traveled to Chicago. In retrospect, I realize that as much as anyone else — more, even, than American artists Kiki Smith and Robert Gober — Muñoz influenced the course of my own life as an artist. I’ve internalized his optically dizzying floors overseen by dwarves, empty balconies, mirrors, and stage curtains not only as part of the landscape of the art world in the 1990s, but as places in my subconscious, like the houses or landscapes that have appeared there regularly over the years in dreams but have no direct corollary in the waking world. This would probably amuse Muñoz. When I mentioned to a friend that I had chosen to write about this piece, his negative reaction surprised me. The very things that attract me to Muñoz’s work — the manipulation of emotional affect to suggest narrative without ever actually telling a story; the ahistorical (or pan-historical) quality of much of it; and, even, the unequivocating presence of the figure — are what repel some other people. But attraction and repulsion are just two faces of the same coin. They are the repartee inspired by a conversation piece. Artist and writer Maria Porges lives and works in Oakland. Currently serving as the interim chair of graduate fine arts at California College of the Arts, she is represented by John Berggruen Gallery in San Francisco. Does Juan Munoz currently have works on view at SFMOMA? I’m not very familiar with his work but just from looking at these images, I can imagine sharing your fascination in it. The figures are so human. Tess– you can see a nice Conversation Piece by Munoz if you visit the De Young Museum in Golden Gate Park. It’s outside, in the garden in back of the cafe, with some other interesting pieces.